Anki OVERDRIVE Announced | Nerd Much? Anki has announced the release of a brand new toy this morning based on their wildly popular Anki Drive, named the Anki OVERDRIVE. The Anki OVERDRIVE will allow players to take control of the supercars of the future using their handheld mobile devices as they battle and race against friends or AI controlled commanders. Players will be able to build epic battlefields within seconds using the magnetic modular track system. In the game, players will also be able to upgrade their Supercar’s speed, weapons and defenses using in-game upgrades. Anki has also noted their intentions to bring exciting new game modes and features on a rolling basis following the game’s launch at no additional cost. Basically, it’s like DLC for your toy. Each Anki OVERDRIVE starter kit, which has an MSRP of $149.99, comes with two supercars and ten separate Flextrack pieces, which are configurable into eight different tracks. Expansion track packs will also be available for $10-$30 per pack, and there will also be other robotic supercars available after launch for $49.99. By the sounds of it, Anki has taken the basic Anki Drive system that was introduced two years ago, and tweaked it for more customization and control over your game. Instead of being forced to use the round track, players are able to build their own mega courses and use even cooler cars. 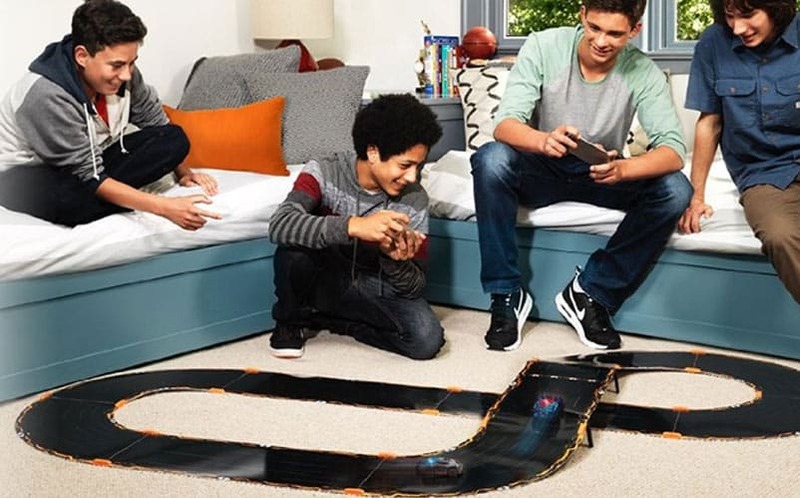 Anki OVERDRIVE is available now on Amazon and at other retailers, and you might want to order soon, as it’s sure to be sold out this holiday season.